Dental bonding is a minimally invasive procedure in which a tooth-colored material is placed, bonded, and hardened with an LED light. A person should take into consideration the existing color of their teeth prior to this procedure as the bonding, once hardened, will not change color. Teeth whitening is always an option to consider prior to any aesthetic procedure. Composite bonding can enhance a smile in many different ways, including closing spaces, correcting uneven or chipped edges, fixing the shape or angulation of a tooth, or covering enamel imperfections such as hyper white or dark areas. 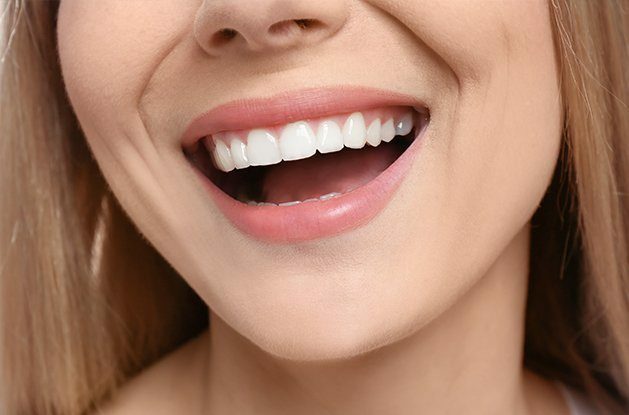 Your doctor has special composite materials in all different shades to match any tooth color, and when layered and sculpted, it can achieve a seamless, natural-looking finished restoration. First, your doctor will condition the existing enamel of a tooth with an etching agent in a controlled environment. This means the patient’s mouth must stay open as saliva will contaminate the bonding procedure. Then, a dental primer and bond will be applied and light cured. The doctor will then start the application of the composite materials. Much of dental bonding is free-hand placement of the materials that requires a specific attention to detail and a great deal of skill. Often, patients will not require anesthesia or down time afterwards as this procedure is non-invasive. Once the composite material is hardened, your doctor will start sculpting the desired shape, check your occlusion or bite, and finish with a high-shine polish. Depending on the individual and recommendations from your doctor, dental bonding can improve small imperfections such as hyper white or dark areas within the existing enamel, close spaces, correct uneven or chipped edges, and correct the shape or angulation of a tooth. As most aesthetic bonding is additive, patients usually do not need anesthesia or experience discomfort at all, nor do they need to sacrifice any tooth enamel, as the doctor only roughens the surface prior to bonding instead of taking healthy enamel away! If you are looking for an immediate result, bonding is for you, as this procedure is completed in just one visit. Compared to porcelain veneers or porcelain crowns, bonding only takes one trip and is less costly. Dental bonding will typically last 5-7 years on average while porcelain veneers and porcelain crowns can last 10-15 years. How you care for your mouth and any staining habits you may have, such as smoking or consuming dark liquids on a daily basis, will affect the life expectancy of your bonding, as the material will thin over a long period of time and collect stains around the edges. Some individuals will require a “touching up” of the bonding more often than others. Depending on where your bonding is placed, you may need to be careful while eating, and you certainly will not want to use your teeth as a tool to open packages, bottles, or remove tags. A clinical oral examination and conversation with your doctor will help you determine if you are a good candidate for dental bonding. Typically, there is no downtime needed with bonding, and because anesthesia is rarely used, you will be able to speak, eat, and smile right away! Your appointment time and cost of your bonding will vary as you need to take into consideration the amount of bonding needed, how many surfaces per tooth will be bonded, and how many teeth your doctor will treat. Normally, aesthetic composite bonding is considered a cosmetic procedure and will not be covered by insurance, however, in some circumstances, there could be coverage. A conversation with our administrative insurance specialist will determine if your specific procedure will be covered by your insurance.